How do, Meghan and all! Glad to see the Theme Park has winter hours! Will Charlie be reporting live from Punxsutawney? I sent him to go "take care" of Phil. He's reporting incorrect reports! I LOVE it when the Drummer Stream flows Underwater! Good afternoon doctorjazz and melinda! @Parq, done that already, it's a good deal, I'd recommend all on the thread participate! Does Julie win the award for furthest listener? ok, i made it!!! thanks for the reminders! Couldn't she have just pushed Joline off a cliff? this version sounds like she easily might! even more killer one-two punch w this Earle!! Just tuned in! Alvino Ray, wasn't he the guy with the talking zither ?? Folks in the NYC area should ignore Phil, he's too far away. 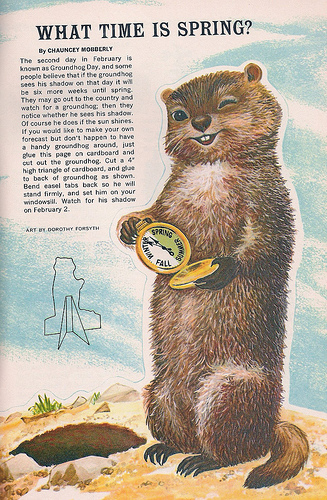 Staten Island Chuck is our groundhog and he predicted an early spring. Alternative Trump tweet: "Filthy dangerous rodent uses junk science to support global warming hoax. Sad!" HA! Yes, completely Parq.... Hey all! Enjoyed some Trouble time... Love seeing my fellow DJ's I don't get to see! A ground hog and a wood chuck are actually the same animal. If a ground hog could hog ground? Awww, I just got some doggie lovin'! Station Manager Ken's dog Lola! Whistlepig is another term. How does is go in that case? Envious of the Lola visit! Looking forward to meeting her when I finally get down there for the Marathon! Thanks for the fine show!